This is one of a many great finds for the ever increasing picture treasure trove of Zamboanga's ancient history, helping us capture a visual representation of what the storied place looked like then. 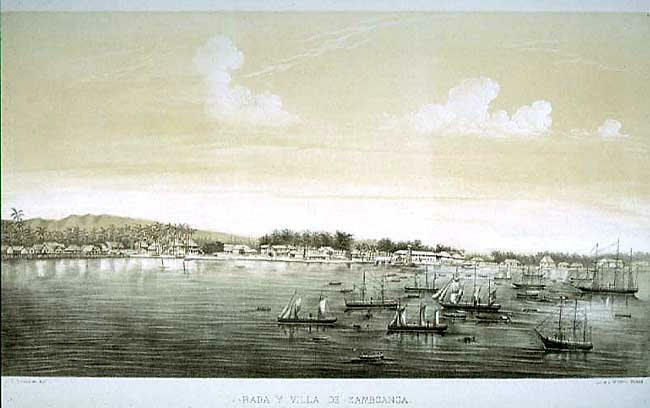 It also shows what kind of activities where happening around the old town of Samboanga during this time period. The above French artist went on a global cruise with a flotilla of French warships, capturing their experiences in his paintings. This old painting entitled "Raid on Zamboanga, Island of Mindanao" seemingly depicts an implied French military sail ship, on fire, apparently from a cannon shot from the visible Fort of Zamboanga - Real Fuerza de Nuestra Señora del Pilar de Zaragosa, seen in the center with its flag raised high. It appears that the fort was victorious in defending the French raid, unless maybe the chef got drunk on tuba and flambéed the ship instead. In a different painting by the same artist in the same time period, it depicts a scene unlike their raid on the Spanish Fort of Zamboanga, showing their friendly visit to the Sultan of Sulu through the Jolo River, with him and his people being the lengthy arch enemy of the Spaniards. Towards the left, one can see the mountain of Pulong Bato or Columbatu. The Chavacanos' village is visibly sprawled outside the fort. The year of this painting is shown as 1846. If anyone can add to the story of this scenery painting, please contact the webmaster. We'd appreciate your input.